Many centuries ago two people – possibly an adult and a child – walked in soft, muddy ground in the Olduvai Gorge in present day Kenya. And, still walking, the descendants of these two went on to walk right across our world. Once, of course, walking was the only way to get around. Then people learned to make boats, to use animals and eventually to create motorised transport so as to avoid wasting time and energy on walking. 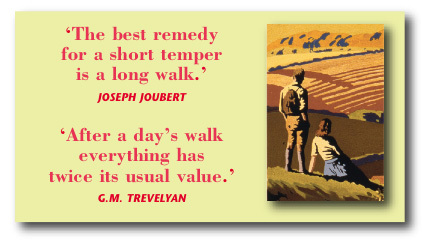 But as leisure time has grown, particularly over the last few centuries, we’ve rediscovered the pleasure of walking. Walking can take us to places no car can reach and, of course, one can linger on the way. In towns we can window shop or visit a cathedral or market, or walk in a park. In the countryside there are myriad places that give us serenity, peaceful views and even silence. All these benefits appear in this collection of walkers’ accounts of their journeys through both countryside and towns, by water, and through open country and woodland … in different weathers, at different times of day and of the year. There are special occasions when we may walk together with others, for example, Trooping the Colour in London, when soldiers and civilians parade through the city streets, thronged along the way by other people who’ve come to watch and to cheer. Sometimes ordinary people may march for a cause – almost always a political one. On holiday we may wander through towns and cities or on country roads and paths – sometimes on rising land, on other walks alongside a river or a canal. We need not always have a destination; we may be walking just for pleasure or for exercise. I have included all these ways of walking in this collection – bringing together the experiences of such famed walkers as Patrick Leigh Fermor on his great walk across Europe, and William Wordsworth and his sister, Dorothy, both in their beloved Lake District and on the continent. One of the great advantages of travel on foot is that walkers can penetrate almost anywhere: into the forests of West Africa, along the Roman roads of Britain, through the wooded hills of North America, beside water on the tow paths of canals or by a river or along a sea shore. In bringing together writers for this book I have used a wide variety of sources. I have brought in writing from novels, from children’s books and from magazines. I’ve used travel guides – such as the very detailed, if now somewhat delightfully old fashioned, Baedeker’s guides – which very often highlight walks that their readers may wish to make in the countries they visit. 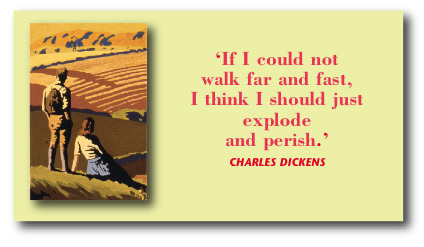 Walking has its own vocabulary: towards the end of a long journey we may ‘trudge’. If we walk together in an organised manner or for a special reason we are said to march. If we walk in a leisurely, perhaps unplanned way, we wander. However we walk and for whatever reason, if we walked through soft mud like that in the Olduvai Gorge long, long ago, we would still leave footprints.